On Show #52, item #17 of the Ed’s Mixed Bag podcast you can download an audio of Doug Kaye’s explanation of the Levelator software as an excerpt from his seminar “The Secret Lives of MP3 Files” at the 2nd Annual Podcasting and Portable Media Expo in Ontario, California. 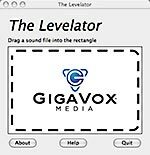 There is also a link on the same line item to the actual Levelator software download! Check it out, and while there grab the Direct Download of show #52, my celebration of 1-year of podcasting, of the Ed’s Mixed Bag podcast!! I couldn’t understand some parts of this article evelator™ at MWGblog, but I guess I just need to check some more resources regarding this, because it sounds interesting. wow, this seems like a great tool. I have been doing a multi mic podcast for almost a year now. levels have been something that I have constantly had trouble with. I will check this tool out for sure!